Photo Gallery of Outdoor Laser Light Projectors in Action! Decorating outdoors for the holidays doesn't have to take hours of work anymore! You can now get your house in the spirit of any holiday with laser light projectors. In just a few minutes, you can create a magical light show display that your family and neighbors can enjoy! Outdoor landscape projectors have become a huge hit across the USA, Canada, and rest the world for holiday and Christmas lighting displays. Imagine what you can do to transform your home and gardens! BlissLights COLOR projectors come with a 16 color backlight that you control with the wireless remote control. You can see how these columns are illuminated by the LED spotlight while the green laser lights are creating a firefly effect. By adding some fog, you will be able to visually see all of the laser beams become Three Dimensional shafts of light along their whole length! Create a romantic setting with the blue and green laser lights. Also, the red laser lights are perfect for decorating during Valentine's day. A single Sparkle Magic Illuminator laser projector can transform any landscape with firefly laser beams. A light colored swimming pool becomes the perfect projection screen for any of our Laser Starfield Projectors! With just one BlissLights TRIO Laser Projector can transform any landscape with your choice of red, blue, or green firefly laser beams - or use them all at once! Light colored fabrics and tents become the perfect projection surfaces. If the fabrics are lightweight enough the beams can be seen on the outside and inside, as you see in the photo above. Create a magical firefly effect on your landscape or patio to enjoy for years to come! Customers love the blue for calming nights or the green lasers for highlighting the beauty of the trees and bushes. The Sparkle Magic Laser Light Illuminator can transform a room with a 160-degree spread of brilliantly colored star beams. See how just one BlissLights Spright COLOR laser projector can transform any landscape with magical firefly laser beams. Having an outdoor party? Use a moving laser light projector to set the mood for a good time.. Just add some music and chilled drinks to the mix! Laser beams shown in the photo above are from a single green BlissLights MOTION laser projector that was mounted atop the Candy Cane pole shown in the foreground. See how you can light up a whole yard with decorative lighting with a single projector! Get in the spirit of Halloween, fast and simple with a few laser light projectors! Here a BlissLights BL-15 Laser Starfield Projector being used outdoors in fair weather for this wedding photo. 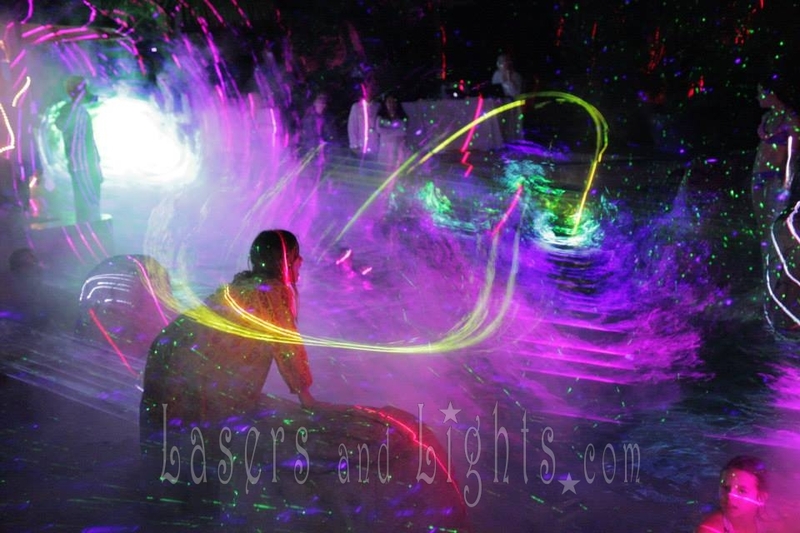 The added lighting effects moving laser beams and the Blue LED Cloudfield make this a popular summer party projector. You can also aim it out of a window any day of the year to keep the projector warm and dry while the effects are seen outdoors. You can visit this dreamy paradise and see these lasers on display each evening in Costa Rica at the Ylang Ylang Beach Resort. Check out the BlissLights Holiday Display using BlissLights COLOR and BlissLights Motion laser light projectors with red and green laser lights. Shown here are exciting examples of Outdoor Landscape Laser Projectors in a variety of settings. Photos can show only so much, but do give you ideas and show how to get the best effects when using laser projectors in your own yard, at special events, wherever you choose! The effect of moving beams on leaves and branches gives the magical appearance of fireflies or lightning bugs flying through the landscape. Laser beams can permeate landscapes for up to 100 yards, projecting at a 160-degree radius from the lens! Before photo above shows the landscape before complete darkness. Spright outdoor laser projectors on backyard pool scene. This after photo shows a magnificent display offered in total darkness by two laser landscape projectors in blue and green. Remember a photo can only capture so much! The green and blue laser projectors combined create an exceptionally dazzling display, shown beautifully against the elegant white building. Remember, lightly colored surfaces display projections best! At the Lucidity Festival, we achieved this "Starfield Galaxy" art installation by mounting 12 BlissLights Motion outdoor laser projectors over a 100-yard section of roadway. Then we created a foggy haze to bring the laser beams to 3D rods of light! Laser beams reveal themselves as three-dimensional rods of light when passing through steam as shown in these photos of Baldi Hot Springs in Costa Rica. Similar outdoor effects will appear when lasers are projected into fog or smoke. The "bands of light" or "laser beam" effect can also be created with a fog machine or hazer and is commonly seen in nightclubs and onstage performances. More 3D laser beams are revealed as they pass through steam in the sauna cave at Baldi Hot Springs. Laser beams from a handheld projector add sparkling effects to steps and shrubs lining this walkway. Handheld lasers create a starfield projection that can be confined to smaller areas as needed. Laser beams become distorted by the water's surface as shown in this photo, but only in person are the beautiful dancing variations of beams revealed as water ripples on the surface. Combined with steam you see 3D bands of light dancing off of the surface with each little wave. Add a fog machine to your indoor or outdoor laser display to make the laser beams become three dimensional for the ultimate magical environment. Light up your guests or performers as you light up your yard! Special Thanks to Kyer Wiltshire Photography for capturing this magical moment. Call on Kyer for Professional Wedding Photography and Portraits. A BlissLight Blue MOTION is used on the porch, safely warm and dry, while one BlissLights TRIO is under a tree in the distance. Spright laser starfield projectors stake into the ground and are designed for outdoor use. Built with an internal heating component, Spright laser lights can be used in temperatures as low as -15°F and use only 5-10 watts of power on a 12V circuit. See how a Blue Spright covers this large building with laser beams. Blue Lasers are not as bright or visible as green, projecting onto white surfaces will create the best effect. A Blue Spright can be disappointing on green shrubbery when compared to a Green Spright as green lasers appear more sharply to the naked eye. All of our Indoor Laser Projectors including the BlissLights BL-15, Bliss BL-50, and Night Stars White Laser Light Projector are commonly used at warm and dry summer parties, weddings, barbecues, dances and gatherings of all sorts; then brought indoors for year-round pleasure. Indoor versions of laser projectors can be harmed by moisture and will stop emitting light temporarily if temperatures drop below 60°F. By strategically placing at a safe distance, and directing a Bliss 15 or Bliss 50 onto the surface of a swimming pool, you can "dive into space". Yet another outdoor setting, where BlissLights BL-50 starfield projectors are being used safely in warm dry conditions for a spectacular display. Here is a fantastic display in Pixie Hollow™ at Disneyland™, where numerous laser light projectors are mounted to add dazzling faerie dust to the Faerie Village™ attraction. A hollow stump in the foreground is bright with beams from the projector hidden there. This outdoor display is augmented by Green and Blue Firefly laser which were mounted from afar as proven by the small number of beams showing in this photo. Projecting at a 40-60 foot distance is the recommended minimum. As the distance from the laser lens to projection surface increases, beams spread further and further apart. Here you see the effects of a Green Firefly Laser on leaves of grass that become "other worldly" with this magnificent lighting effect. Moving beams projected onto leaves and branches from landscape lasers give a magical appearance of fireflies or lightning bugs flittering through the landscape. See how Green and Blue lasers add sparkling effects to white tent fabrics and hanging lamps with low lights of their own. Holiday lighting is the most popular use for outdoor landscape lasers. Thousands of homes have covered their walls and landscapes in beams from simply plugging in a single projector. Say goodbye to ladders and string after string of bulbs! 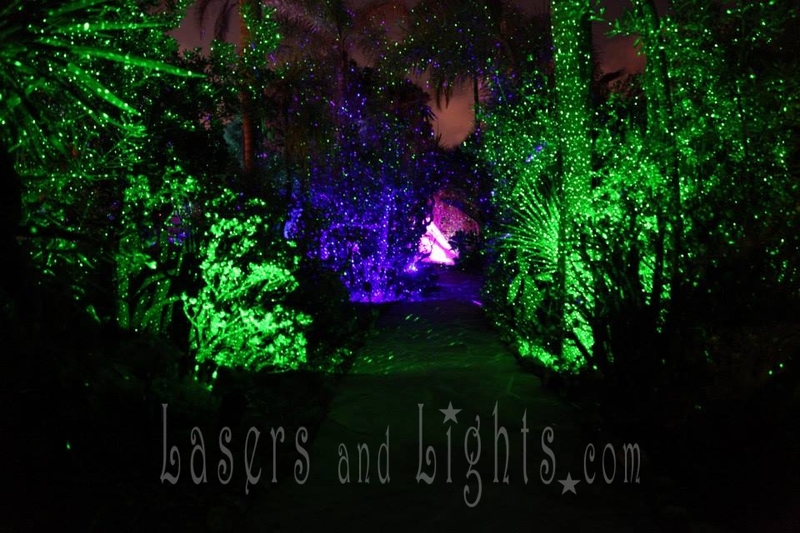 After decorating for the holiday season, most use their outdoor lasers in the backyard, patio set, or even indoors! Even a single palm tree can be transformed by using one Sparkle Magic Illuminator projector staked at the base. Another example is shown here of laser beams' full-length becoming visible when combined with fog or haze. Be sure to experiment with this added magical effect even with a stick of incense or puff from a cigarette. Try looking towards the projector through the smoke and you'll feel like you're traveling through space in a Star Wars™ movie! Watch laser beams cover your home and landscape nightly as the sun goes down and your home becomes a magical fairy tale. Here is an example of a BlissLights BL-15 or Bliss 50 indoor projector used outdoors during fair weather to get the added Blue Cloudfield effect for a starry night sky appearance that BlissLights Laser Starfield Projectors are famous for. As long as the projector's temperature stays above 60°F and remains dry, operating outdoors to create the effects shown is safe. Common "pop up" white tents, domes, and other shade structures make perfect surfaces to exhibit laser projections. Brides often request this Starry Night lighting effect for ceremonies or receptions! The green firefly has become one of the most popular landscape lighting effects, displaying thousands of laser beams, traveling for hundreds of feet, at a 160° radius. Spright outdoor landscape starfield projectors are operable in temperatures as low as -15°F. Don't forget to follow us on Facebook for updates on the newest products and special promotions!